Vital Fisheries - Setting pathways for the implementation of International Guidelines for Small-Scale Fisheries in Brazil is a final report of the National Seminar on Capacity-building for the Implementation of the Voluntary Guidelines for Small-scale Fisheries that took place in Brasília, 13-17 June 2016. The seminar's objective was to disclose and stimulate discussions and lessons learned about values, norms and principles contained within the SSF Guidelines and to enable support for their implementation in Brazil. TBTI was one of the organizations supporting the seminar. 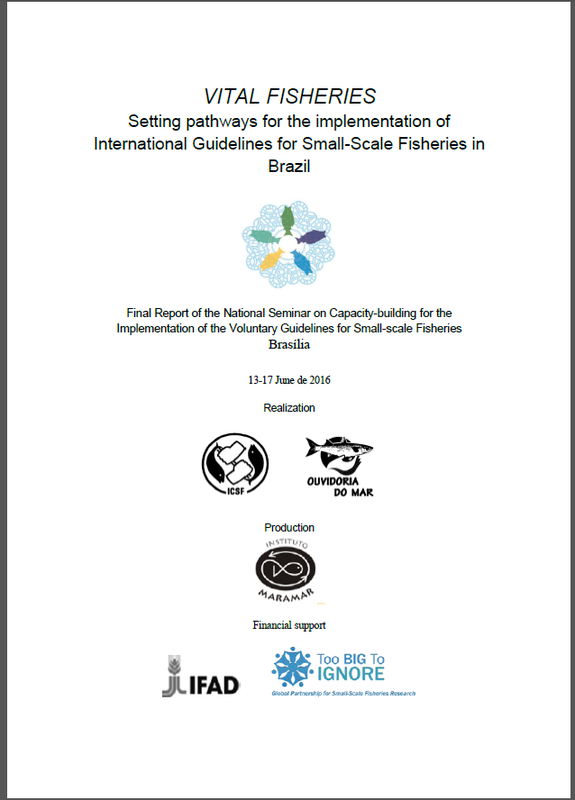 The report indicates the challenges for successful implementation of the SSF Guidelines and outlines the fundamental and pressing policy actions recommended by Brazilian SSF Seminar participants to small-fisheries organizations representatives, governmental authorities and all Brazilian citizens engaged in the implementation of the SSF Guidelines in Brazil.